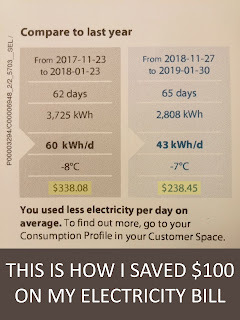 I got my electricity bill in the mail and was really surprised to see how much I saved. 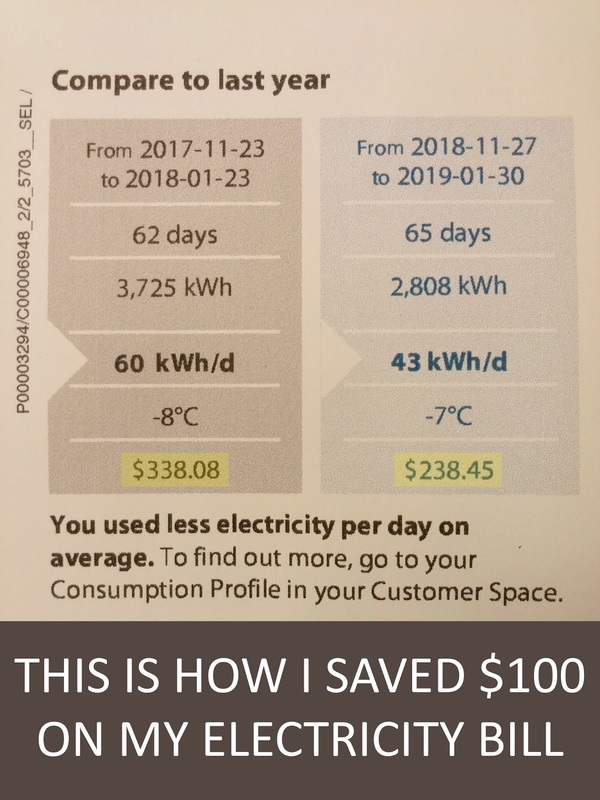 I saved a $100 on my hydro bill by doing a few tricks and today I would like to share with you what I did. Before I get down to more details, let me tell you what it takes to save on electricity. You need to isolate your place so the cold air doesn’t come in and the hot air doesn’t come out. That’s the basic rule. I isolated my windows and my patio door and reduced hot water consumption. In my condo, I have double slider windows and patio door and I noticed that a lot of cold air is leaking through the lower panel. So I took old towels that I don’t use anymore and rolled them in a tube shape. Then I placed the towel between the sliding windows and patio doors. That stopped the leak from outside completely. Therefore I used less electricity to heat the rooms. I cut down on hot water consumption. When I do my dishes, I fill up the sink with hot soapy water, wash the dishes and then rinse them with lukewarm water. This way the water is not constantly running while I wash the dishes. I apply a similar technique in the shower. When I shower I turn off the water when I leather up. So I soak in for a minute, turn off the water, leather up and then rinse off with warm water. This way the water is not wasted. I still use warm water for the comfort. I just use it more efficiently. When I shave, I fill up the sink with water to clean the razor. It takes a few minutes to shave, but it still makes a difference of how much hot water I’m saving. Well, that’s it guys! I really hope that savings are real and it’s not a mistake on their end… ha ha. Let me know, what you did this winter to save on electricity bill. By the way, the $100 savings is going to go directly to my wife’s TFSA account. Wow, your electricity must be quite cheap. Here in South Australia we have the highest price for electricity in the world apparently. With this a lot have adopted solar panels and are very frugal when it comes to using electricity. Luckily for us we have a very moderate winter but a hot summer. A lot of people have learned how to deal with this heat in different ways. Thanks for sharing. I think in Quebec we have the lowest rate. It comes out to around 11 cents per KWH. How do you deal with heat in a hot summer? I may use some of the tips in the upcoming summer.